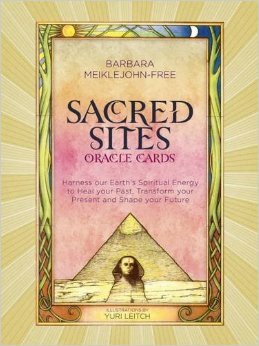 The nice folks at Watkins Publishing sent a review copy of the Sacred Sites Oracle Cards by Barbara Meiklejohn-Free, with illustrations by Yuri Leitch. The cards and book are packaged in a nicely designed slipcase with a pull ribbon, which makes it easy to slide the set from the outer box. The deck contains 53 cards of various sacred locations around the world. There are 13 cards for each of the four directions, and the card depicting Mecca is Power Card, which emphasizes the message of the other cards drawn. Each direction carries specific attributes–for example, most of the sites in the South suit are places of healing, so if you draw a number of Southern sites, the focus of the reading is on healing energy and actions. By viewing the card image with each of these perspectives in combination with its underlying directional energy, additional meanings arise, and you can more easily see how the message of the card applies to where you are, what factors led to the situation, and also how to make the most of the potential. The companion book describes a suggested ritual or meditation to acquaint the reader with the energy of the place, and with the deity (if any) associated with it. For those unfamiliar with a particular location or the culture of the place, the ritual is a helpful addition to the narrative to enable the reader to tap into the energy of the place and its spirits. The book is lushly printed on excellent quality paper, and the cards are on substantial cardstock with a smooth, non-glare coating, which makes them pleasant to shuffle and good to read, discerning the small details in the drawings with ease. This is a lovely addition to Watkin’s divination line, and users will greatly enjoy the combination of interesting ideas, concise text, and engaging imagery the deck offers.